The way we wore The story of modern fashion--from couture to mass market The 20th century saw fashion evolve from an exclusive Parisian salon business catering to a wealthy elite, into a global industry employing millions, with new trends whisked into stores before the last model has left the catwalk. Along the way, the signature feminine silhouettes of each era evolved beyond recognition: House of Worth crinolines gave way to Vionnet's bias-cut gowns, Dior's New Look to Quant's Chelsea Look, Halston's white suit to Frankie B. 's low-rise jeans. In menswear, ready-made suits signaled the demise of bespoke tailoring, long before Hawaiian shirts, skinny ties or baggy pants entered the fore. "20th Century Fashion" offers a stylish retrospective of the last hundred years, via 400 fashion advertisements from the Jim Heimann Collection. Using imagery culled from a century of advertising, this book documents the unrelenting pace of fashion as it was adopted into the mass culture, decade by decade. 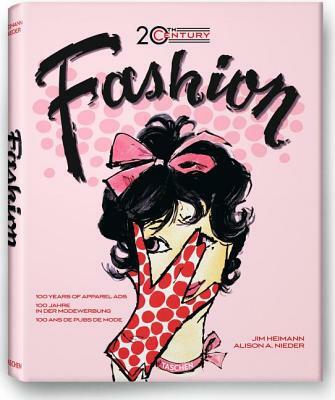 An in-depth introduction, chapter text, and illustrated timeline detail the style-makers and trend-setters, from couture to the mass market; and how the historic events, design houses, retailers, films, magazines, and celebrities shaped the way we dressed--then and now. Description: Text in English, French and German. Superbly produced large (460 pages) book with illustrated endpapers and wonderful examples of advertising art arranged chronologically.